As much talk as there is about 2016 being terrible, it was a fantastic year for games. There was an abundance of fantastic releases, and plenty of good surprises – against all odds, Watch Dogs 2 turned out to be good, and Final Fantasy XV actually came out and was better than anyone could have expected. I had dozens of “game of the year” contenders, and plenty of other games that probably would have been in the mix if I’d had time to play them. Now we’re a few days into 2017, and somehow, it’s looking even better. The sheer volume of great-looking games is staggering, and there’ll no doubt be plenty of surprises that haven’t even been announced yet. To top it all off, the Nintendo Switch is due out this year – here’s hoping the big N learnt its lesson from Wii U and gives the new console a chance to hit the ground running. This was quite the surprise announcement at PlayStation Experience 2016. We all new a standalone story expansion was on the way for Uncharted 4, but a Chloe-centered story seemed like it’d never happen. But here we are. Uncharted: The Lost Legacy looks like it might be the game I wanted Uncharted 4 to be. I still have my reservations, but at the very least, it’s good to know that Naughty Dog hasn’t completely forgotten about Chloe. Dragon Quest XI will be the first numbered, single-player game since Dragon Quest IX came out in 2010 (Dragon Quest X was an MMO). This franchise is no stranger to spin-offs, but new entries in the main series are relatively rare, and always cause for excitement. Oddly enough, Dragon Quest XI is releasing across PlayStation 4, 3DS, and Switch. The PS4 version is utterly gorgeous from what we’ve seen so far, and the 3DS version can switch between lovely 2D graphics – reminiscent of the Nintendo DS Dragon Quest games – and a 3D look akin to Dragon Quest VII and VIII. (We don’t know what the Switch version looks like just yet). They’re very different versions of the same game, and I must say, I’m very tempted to buy both the PS4 and 3DS versions, at least – and once we know more, maybe the Switch version as well. There’s no Western release confirmed at this stage, but a localisation of the PS4 version, at least, seems likely. That said, I’m so amped for Dragon Quest XI that it’ll be a day-one import for me. Horizon Zero Dawn isn’t a game I would ever have expected from the folks behind the cold, “gritty” world of Killzone. Everything about this game looks absolutely gorgeous, from its reclaimed-by-nature world to the strange mechanical beasts that roam it. Of course, there’s also Aloy, the game’s fierce, beautiful protagonist – she makes me think of an un-Disney-fied Merida from Brave. I have no doubt that exploring the world of Horizon Zero Dawn is going to be a remarkable journey, aided by a Monster Hunter-like progression system and tool-based combat that looks frantic and creative. I can’t wait. A new Legend of Zelda game has been a long time coming, especially one for console rather than handheld. From the relatively little we’ve seen of it, The Legend of Zelda: Breath of the Wild looks like it’ll be worth the wait. I’m normally a bit wary of “open-world games”, but Zelda is one series I can see really suiting such design. They’ve also been somewhat open in their world design anyway, so Breath of the Wild‘s full open world is a natural next step. On top of that, it’s got a gorgeous cel-shaded art style, lovely new character designs (especially for Zelda herself), and a revamped combat system. The Nintendo Switch’s launch day line-up is looking a bit sparse, but The Legend of Zelda: Breath of the Wild will be more than enough until the rest of the console’s year-one games start rolling in. Guardians of the Galaxy and Telltale Games should be a match made in heaven. As much of an impact as Telltale have made with serious drama games like The Walking Dead, they still shine brightest with comedy – the exceptional Tales from the Borderlands is proof of that. Guardians of the Galaxy will let Telltale work those funny bones again. I didn’t think the Guardians film was all that great, but it’s full of potential. With the right team, Telltale can take weave that into another masterpiece in the vein of Borderlands. The long-dormant Wild ARMs series is coming back, courtesy of ForwardWorks, PlayStation’s new push info the mobile space. A lot of folks are upset that it’s a mobile game, but that’s better than nothing, which was the alternative. If this does well, it could also spark interest in developing a new Wild ARMs console game. Not much has been revealed about Wild ARMs Mobile, but we know it’s a crossover project with characters from earlier games, like the wonderful Virginia Maxwell from Wild ARMs 3. Apparently it’s being worked on by original Wild ARMs staff – hopefully long as that includes Michiko Naruke on music. This isn’t confirmed for 2017, but with mobile cycles and Sony’s plans to have all currently-announced ForwardWorks games available by March 2018, my money’s on a release towards the end of this year. Hellblade: Senua’s Sacrifice is an action-adventure game from the talented folks at Ninja Theory, which alone is enough to make it a game worth looking forward to. What has me far more intrigued is the game’s use of mental illness as a central theme. The game follows the warrior Senua on a journey through hellish manifestations of her psychoses. This conceit isn’t new, but games (and other art forms) that use hallucinations in this way rarely do it care or justice. With Hellblade, Ninja Theory are deliberately trying to go for something as authentic and sensitive as possible, and are working with the Wellcome Trust and psychologist Paul Fletcher to ensure the game’s approach to mental illness is as authentic as possible. There are a lot of great indie games looking at depression, but it’ll be good to see a game with a AAA attitude (“independent AAA”, Ninja Theory calls it) take the subject seriously. Further reading: Hellblade creative director Tameem Antoniades on working with Paul Fletcher to get the game’s approach to psychosis just right. Super Mario Bros. and Grand Theft Auto would be one weird mashup, but that’s exactly what Super Mario Odyssey looks like. It’s a 3D Mario game in the vein of Super Mario Galaxy, with wide open spaces full of room to explore. Oddly, among Odyssey‘s locations is “New Donk City”, a New York-inspired metropolis full of realistically-proportioned humans dressed like its the ’50s. It’s quite bizarre, jarring even, seeing cartoony Mario in this somewhat lifelike world, but I dig it. The 3D Mario games are the best Mario games, and I expect Super Mario Odyssey to be right up there with the rest of them. Being the first Dragon Quest game released in Australia and New Zealand, Dragon Quest VIII was my introduction to what’s become one of my favourite series. I’ve been wanting to revisit it for some time (and maybe even finish it, after all these years! ), so the 3DS port is more than a little welcome. It’s been available on mobile for some time, but that version’s stripped down somewhat and it’s not a game I’d want to play on my phone, anyway. The 3DS version of Dragon Quest VIII expands on the already massive game with new quests, an expanded story with alternate endings, and two new characters. I have no doubt that this will be the best version of a game that was fantastic to begin with. A new game from the creators of the brilliant Gone Home, this time set in space. What more could you want? I could never really get into Minecraft, though I tried a few times. Having said that, I really love the idea of it (and I absolutely adore Dragon Quest Builders), so a LEGO-themed take on the block building genre might be exactly what I need. The idea of building LEGO things without the constraints of actual bricks sounds wonderful. I bought LEGO Worlds when it came out in Early Access a while ago, though I couldn’t really play it on my crappy old computer. It looks like it’s undergone a lot of optimisation though, and my laptop should be up to the task now. Still, it’s the console version I’m really looking forward to – just lying on the couch, controller in hand, playing LEGO, without the risk of cats running off with my bricks. Danganronpa is one of the greatest game series around. It effortlessly combines captivating whodunnit stories with deep philosophical themes and surreal mindfuckery that almost defies description. It’s funny, it’s thought-provoking, horrifying, stylish, and bizarre, all at the same time. In 2017, we’re getting at least one new game in Danganronpa V3: Killing Harmony. Monokuma is up to his old tricks, but otherwise it’s a new setting, with a new class, embroiled in a new Killing Game. It’s looking like more of the same, at least as far as mechanics go – a visual novel with some adventure and puzzle elements – but I wouldn’t want anything else. I completely missed the original Nier, but I’ve heard and read so many fascinating things about it (mostly from Matt Sainsbury of Digitally Downloaded). I’ve spent the last few months trying to find a copy of the original that doesn’t come ridiculous shipping costs, but no luck. Never mind, because the sequel, Nier: Automata, is almost here. It promises to keep up the complex nihilistic philosophy and quirky game design of the original, but with a lot more polish courtesy of PlatinumGames. I’d still like to see a Nier remaster, but Automata is what I’m most excited for now. Read Matt Sainsbury’s article on the philosophical underpinnings of Nier. I’m not normally all that interested in military shooters, but I like stealth games and I always enjoy playing a sniper. As a stealth game with a focus on sniping, Sniper Elite pushes all my buttons. I got my introduction to the series a couple of years ago with Sniper Elite 3. The new game is looking like more of the same, but in a new setting – Italy, this time – and I couldn’t want more. I was pleasantly surprised by Dragon Quest Heroes, a mashup of Dragon Quest and Koei Tecmo’s Musou series (Dynasty Warriors, Samurai Warriors, etc). I’ve never really liked Musou all that much, but the addition of more RPG elements and the lovely aesthetic of Dragon Quest worked well. I can only assume Dragon Quest Heroes II is going to be more of the same, but bigger and with more characters. I could want nothing more, to be honest. I still know almost nothing about this, despite having actually played a small snippet, and that’s what intrigues me so much about it. What Remains of Edith Finch tells the story of a few generations of the Finch family, with different chapters focusing on different characters. Moreover, each chapter has its own mechanics and style – the bit I played was a lifelike first-person adventure, but other parts of the game will be quite different. I can’t wait to how these different approaches come together to tell the story of Edith Finch and her descendants. I didn’t like Final Fantasy XII when it first came out, mostly because it was “too different”, whatever that means. Over time, I’ve come to appreciate it a bit more on reflection, and I’ve been wanting to revisit it for a long time to see how I’d feel. Unfortunately, the lack of a PS2 has kept me from being able to do that. That’s the main reason Final Fantasy XII: The Zodiac Age is such a big deal for me. It doesn’t hurt that it’s based on the International Zodiac Job System version of Final Fantasy XII, which was previously only available in Japan. This version revamped a number of aspects of the game; most significantly, it introduced a Job system similar to those of games like Final Fantasy Tactics. I do love me a Job system. Super Mega Baseball kinda came out of nowhere when it launched in late 2014, but it made a splash. It was a cute, silly, arcade-style baseball game the likes of which we hadn’t seen in many years. More importantly, it’s core design cut to the heart of what makes baseball a great sport in a simple, clean, effective way. Super Mega Baseball 2 looks set to build on that base with things like online multiplayer, more customisation options, and more realistically-proportioned character models. This will no doubt be 2017’s finest sports game. There’s a lot of call for a revival of the 3D platformers of the late ’90s. A few attempts have been made, but none really hit the mark. Yooka-Laylee looks at to be the one that does. It’s developed by a small studio made up of people who cut their teeth on the acclaimed Banjo Kazooie series for Nintendo 64. Who better to spearhead a proper 3D platformer revival, and everything we’ve seen of Yooka-Laylee so far looks fantastic. I don’t think there’s any game I’m more excited for than Persona 5. It’s looking even better than Persona 4,which is one of the greatest games of all time. 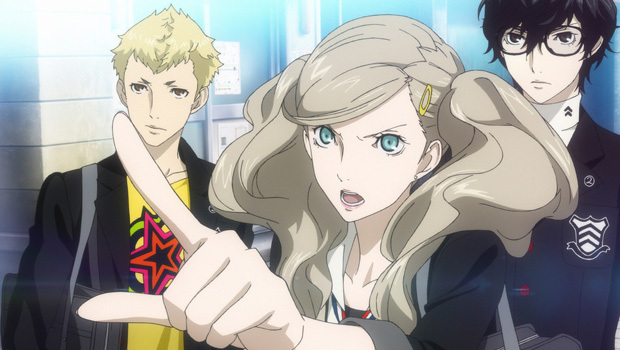 It’ll be Persona’s usual combination of oddball fantasy, slice of life, silly humor, and psychological themes, but all wrapped up in a picaresque plot. I’m calling it now: this will be 2017’s game of the year. There are so, so, so many more games to look forward to in 2017, but these are the games that I’m most excited about – that I’ll be there for on day one.